Geneva: Where the Muslims Rule and the West Caves In. In early 2009 the United Nations Human Rights Council (UNHRC) will be holding a large conference to deal with the world’s human rights issues. Will they be addressing the ongoing genocide in Darfur? Will they finally address the inequality of women in Muslim nations? Will they address the systematic murder of homosexuals, Christians and Baha’i in Iran? 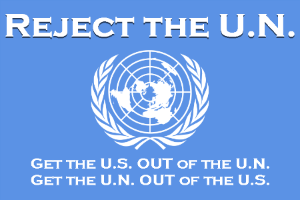 Support for Israel has never ranked high on the United Nations’ agenda. And the upcoming World Conference Against Racism, scheduled for early 2009 in Geneva, Switzerland, presents a valid case. Many observers are concerned that the UN-sponsored event will simply serve as yet another a platform to launch attacks against Israel — as the previous world anti-racism conference did in Durban, South Africa, seven years ago. Even by the standards of the organization’s traditional antagonism toward the Jewish State, the U.N.’s 2001 Durban gathering marked a low point. To the extent that “racism” was discussed, it was only to condemn Israeli policies. Little wonder that the conference, known as “ Durban I,” is largely remembered as a U.N.-backed assault on Israel. Now it’s back. And if early evidence is any guide, Durban II, as the Geneva event is already being called, will be a replay of its predecessor. Consider that the chair of the conference’s planning committee is Libya, whose longtime leader, Muammar Gadhafi, has recently claimed that the Israeli Mossad aims to assassinate Barack Obama. The vice chair of the conference, meanwhile, is communist Cuba. And the fact that Iran’s president has notoriously called for Israel’s destruction has not, expectedly, prevented it from playing a key leadership role in the upcoming conference. For their part, Western countries should make clear that they will not allow the OIC to dictate what can and cannot be said about Islam. Instead, they should shift the focus onto the OIC. Instead of concerning themselves with alleged Western prejudices, Islamic states would do well to ponder the rampant racism in the Muslim World. Darfur, where an estimated 300,000 Muslims have been killed by their fellow Muslims, prompting the United Nations to call it the worst human rights disaster in the world, would be a logical starting point. From there, the OIC might consider the continued bloodshed between Shiites and Sunnis, and the fanatical suicide bombers who have claimed the lives of thousands of their co-religionists. One need hardly look to the West to find “Islamophobia” in action. As for “racism,” the conference’s nominal subject, it is worth bearing in mind that slavery – the most racist of practices – endures in the Islamic world even as it has been abolished in the West. In OIC member states like Sudan and Mauritania, Arabs still keep black African slaves. Sudan ‘s president, Omar al-Bashir, who was indicted by the World Court for human rights abuses in Darfur, is reputed to have black slaves in his own house. According to NGO reports, some 200,000 southern Sudanese have been enslaved during Bashir’s reign, a practice that the UN has charged is “deeply rooted in Arab and Muslim supremacism.” (Such grim statistics did not deter the Sudanese Minister of Justice from demanding, in a stunning act of hypocrisy, reparations for historical slavery during Durban I.) And while Mauritania legally abolished slavery in 1980, it is still practiced secretly. Even Muslims in the West have not accepted its ban on slavery. For example, four Arab princesses were found in July living in Brussels with 17 slaves. The persistence of slavery in the Muslim world is not, of course, surprising. In August 1990, the Cairo Declaration of Human Rights was affirmed by the 57 member states of the Organization of the Islamic Conference (OIC). It stated that Islamic Sharia law is the sole source of the Islamic perspective on human rights. And slavery is codified in Sharia law. It is doubtful, naturally, that this detail will be much discussed during Durban II. In light of recent history, it makes sense that Israel has decided to boycott next year’s conference. Canada has also decided to boycott Durban II, and other Western countries should consider following the Canadian example. It’s the height of absurdity for free nations to have to endure lectures on human rights from its preeminent abusers. In 2001, they could have claimed to be unaware of the conference’s sinister agenda. Seven years later, ignorance is no longer an excuse or an option. Geneva, Sept. 8, 2008 — After new UN rights chief Navanethem Pillay addressed the 47-nation Human Rights Council for the first time today, independent human rights organization UN Watch praised her “inspiring life example as an anti-apartheid advocate,” yet expressed deep concern over her remarks praising the UN’s preparations for a follow-up to the troubled 2001 Durban world conference on racism. Her defense of the Durban process was immediately hailed in the plenary by Pakistan on behalf of the Islamic states, Egypt for the African bloc, Cuba for the Non-Aligned, Russia and South Africa. Without mentioning their names, Pillay criticized the current absence in the UN deliberations of Canada, the U.S. and Israel, as well as similar threats to walk out of the already controversial April 2009 conference made by the French, U.K. and Dutch governments. “I do not believe that ‘all or nothing’ is the right approach to affirm one’s principles or to win an argument,” said Pillay. “Should differences be allowed to become pretexts for inaction, the hopes and aspirations of the many victims of intolerance would be dashed irreparably. For these reasons, I urge those governments that have expressed an intention not to participate to reconsider their position,” she said. According to UN Watch, Pillay “is shooting in the wrong direction. Why is the high commissioner aiming her fire at the world’s most tolerant democracies, instead of at racist tyrants like Sudan’s Omar al-Bashir and Iran’s Mahmoud Ahmadinejad who, under the chairmanship of Muammar Qaddafi’s Libya, have already begun to hijack the conference?,” asked UN Watch executive director Hillel Neuer. “We remind the high commissioner that in 2001, the most virulent and inciteful language of the Durban declaration was removed only under the pressure of European threats to walk out, as the U.S. and Israel did. So too now, the threat of Western non-participation remains the only force with the slightest chance of preventing the conference from degenerating into an out-and-out fiasco,” said Neuer. An early draft of the April conference’s outcome document, released by a UN planning committee on Friday, reserves space to include provisions adopted by the African conference in Abuja. The Abuja text calls on states “to refrain from condoning incitement to racial and religious hatred and violence under the pretext of free speech” (par 13). It also expresses “concern about the plight of the Palestinian people under foreign occupations” (par. 32). The rest of the document focuses on Western practices today and in the past against people of African descent. I do not expect that the Geneva conference aka Durban II will be any different than the first Durban conference. Darfur will not be discussed. Women’s rights will not be discussed. Gays, Christians and Baha’i will not be discussed. Slavery will not be discussed. But Israel and Judaism will be condemned over and over and over again. I am glad that at least 3 nations will not be attending this hatefest. Israel, Canada and the United States already have said, “Thanks but no thanks!” to the hatemongers. It is time for the rest of the Free World to come on board and reject this obscenity. Filed under: Durban, Durban II, UN Human Rights Council |	Comments Off on Geneva: Where the Muslims Rule and the West Caves In.